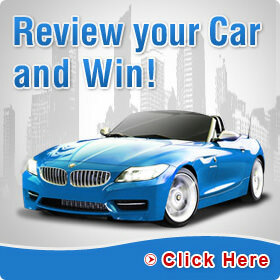 Home» Car Hire » Which is the Best Car Rental Company in South Africa? 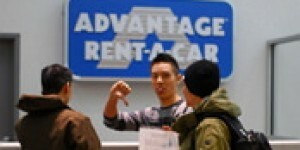 At one stage or another, we all end up using a car rental company. For example, if you’ve had an accident and need a replacement, when you go on vacation and don’t want to use your own car due to the distance, or even if you don’t drive that often so it’s more feasible to rent a car once in a while. But what’s really interesting is that almost all of us, regardless of how many times we’ve rented a car, have a bit of fear about doing so, mainly because we feel that if we aren’t careful, the price we’ll eventually be charged won’t be the price we were initially expecting. Disclaimer: Although our review is not scientific, in order to reach an educated and well based conclusion we tried to base this article on as many facts as possible, together with a simple point system. That said, our conclusions are not proven facts, and should not be construed as any form of advice or persuasion to use a specific service or company. Additionally, we’d like to point out that none of the car rental companies paid or influenced this article in any way [if any of them do offer to advertise after this article, we will mention this]. How Was the ‘Research’ Done? Basically, we’ve broken down this research into three areas. The first of these is how many locations each company has and the second is which services the companies offer. Both of these sections were based on information from the company’s websites. Thirdly, we looked at how consumers rated each company, based on information from the Hellopeter website, a website that lets consumers rate companies based on their experience. To make our conclusion easier to understand, we added a point system: In each of the three categories, the first place winner gets 5 points, the runner up gets 4 points, and third place gets 3 points. Then, we added all the points from each category, and voila, we have the results. 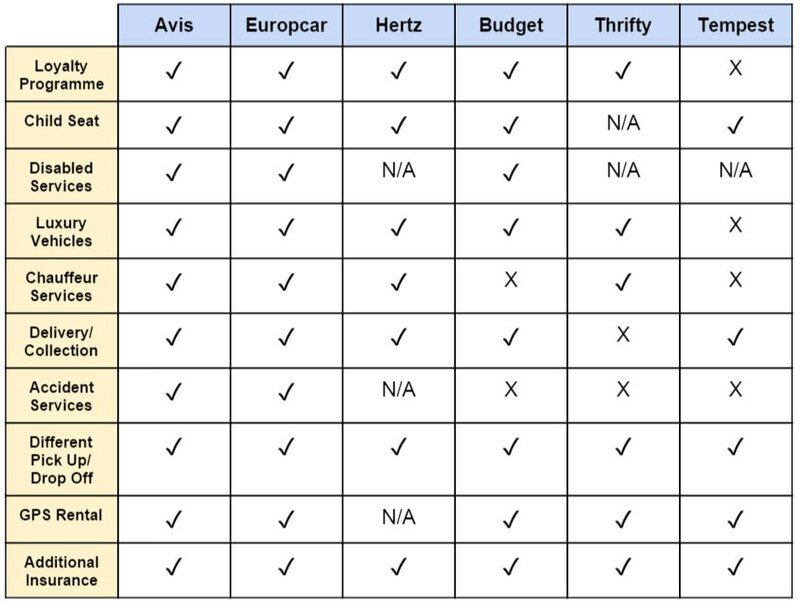 We looked at the six major South African car rental agencies: Avis, Budget, Europcar, Hertz, Tempest and Thrifty. You might be wondering why we aren’t talking about pricing in our review. There are actually a couple of reasons for this. 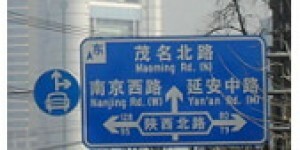 Firstly, there are many special offers available that are constantly changing. Secondly, there are simply too many factors that influence the end price of a rental car: the age of the driver, the kind of car you want, how long you are renting for, where you’re picking up your vehicle and if you wish to drop off your vehicle in another location – all of these will effect your final pricing. Lastly, some of the companies require that you provide your credit card details before getting a quote – something that we personally found to be very annoying and perhaps even a deterrent to using that company’s services seeing as how often people like to compare before making a decision – something that we feel is legitimate. So, we preferred skipping this aspect rather than providing you with inaccurate data. We assume that if the second best company offered you a much better price, the average person would take that offer and that if the price didn’t vary that much, then the first and more expensive offer would probably be selected. Obviously, Avis comes out on top here, getting 5 points, Budget gets 4 points, and Europcar gets 3 points. But all six of the major car rental companies do offer services at all of South Africa’s major airports, so if you’re flying then location might not be as much of a concern. 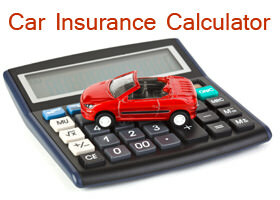 Additional Insurance: does the company offer additional insurance options over and above the basic insurance?. 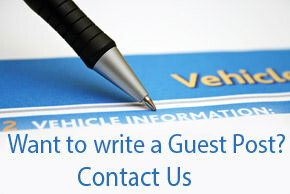 What Do Customers Think of These Car Rental Companies? Surprised? Customer satisfaction numbers for car rental agencies are pretty low overall which fits with our description in the beginning of this article regarding customer’s concerns. That said, and in order to be fair, there are two considerations that you have to keep in mind: firstly, consumers are more likely to take the time to report a negative experience compared to a positive one. And secondly, and perhaps more importantly here, most customers don’t use car rental companies regularly (maybe once or twice a year) which means that a bad experience will seem more serious to that person, simply because he/she has nothing else to compare it to. Couple that with the fact that many people who rent cars are going on holiday, and a bad car rental experience can effect what’s supposed to be a fun and relaxing vacation, and you can understand why customer satisfaction numbers might be pretty low. 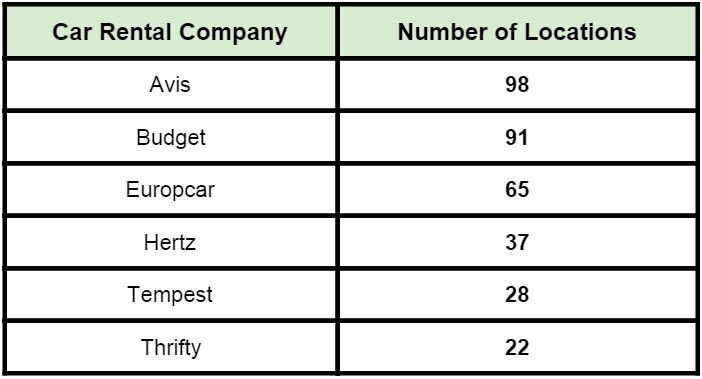 Anyway, based on these numbers, Hertz Car Hire comes up on top getting 5 points, followed closely by Avis, with 4 points, and then Tempest in third with 3 points. Advertisement: Don’t want to end up paying for a rental after an accident? Get insured now! So Which Car Rental Company in South Africa is the Best? First place: Avis. Due to its many locations, a full list of services and the second highest customer rating, Avis got first place in two categories and second place in the third, giving them 14 points in total and first place. * Apparently not only we reached this conclusion. In 2014, Avis won the World Travel Award for best car rental agency in South Africa. These awards are nominated by and voted for by travel professionals. Second place: Budget, Europcar and Hertz are all tied for second, getting 8 points. Third Place: Tempest with 3 points. Final words. Although the article isn’t scientific, and although we are well aware that other factors should and can be taken into account – such as pricing, we hope that this article will at least provide you with more information so that you can make a more educated decision.